We’re a family run business dedicated to help customers achieve their health goals through use of high quality food supplements. We’re proud to have helped helped hundreds of thousands of customers across the world achive their goals. Help us impact the lives of others. Each month Earths Design helps provide daily doses of health boosting Vitamin Supplements to pregnant mothers and children in need in Kenya for every bottle sold. The UK has the highest food manufacturing standards in the world. Earths Design supplements are produced to the highest manufacturing standards in state of the art facilities. Earths Design food supplements are made under GMP certified facilities. We’re here to help. If you have any questions or concerns we will happily provide you with the answers. Earths Design food supplements are backed up with a 100% Money Back Guarantee. We have a No questions asked policy. Feel the benefit or get your money back! Click on the ADD TO CART button and start your lifestyle change today! ✅POWERFUL INGREDIENTS! Our formula is a blend of Raspberry Ketones, African Mango, Glucomannan, Green Coffee Bean, and Capsicum extracts. ✅GREAT VALUE! Formulated with premium, high quality ingredients. Our 90 vegetarian capsules gives amazing value keeping you replenished for up to 3 months. There’s no need to remember to reorder every month. ✅HELP CHILDREN IN AFRICA! Every month Earths Design provides daily doses of health boosting Vitamin Supplements to children in need in Kenya for every bottle sold. ✅PREMIUM QUALITY! 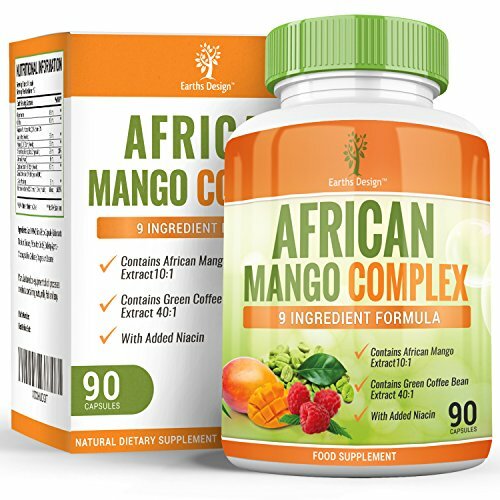 Earths Design African Mango Complex is made in the UK. It’s made to the highest standards of hygiene unlike other imported brands. ✅WHY EARTHS DESIGN? We’re a family run business dedicated to help customers achieve their health goals through use of high quality supplements. We back this up with a 100% money back guarantee. Order now and start your lifestyle change today! HEAVILY REDUCES CALORIE INTAKE – Our Glucomannan (Konjac Root) supplement is designed to make you feel fuller before meals which prevents over eating. Each veggie capsule provides a whopping 500mg of high quality Glucomannan making it a great support for your weight loss goals. A diet pill suitable for both men and women. HIGH IN NATURAL FIBRE – A fantastic source of natural soluble fibre which improves your digestion and bowel health by increasing the good bacteria in your gut making your body feel happier. A natural way to detox. CHROMIUM PICOLINATE – We’ve added 240mcg of Chromium Picolinate to each of our capsules to help fight food cravings. Chromium Picolinate plays a vital role in speeding up fat metabolism making it the perfect partner for Glucomannan. VEGETARIAN, VEGAN AND COELIAC FRIENDLY – Our mission is to reach out to as many people as possible – no one likes being told they can’t have something. 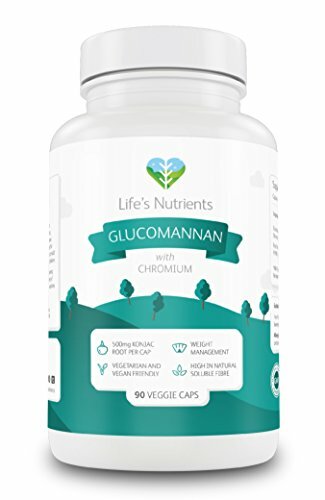 That’s why at Life’s Nutrients we have made sure our glucomannan with chromium supplement is vegetarian and vegan friendly as well as being gluten free. CERTIFIED UK QUALITY – All of our products are manufactured in a ISO certified facility in the UK that follows good manufacturing practices (GMP) and are dispensed under the hazard analysis critical control point (HACCP) system. This assures each and every product is of high quality. We are very confident that you will love our natural product. However, if you are not satisfied in any way, all purchases are covered by a 30 day 100% money back guarantee. 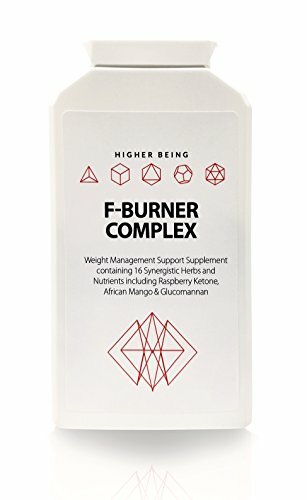 F-Burner Complex weight loss tablets support the body’s natural fat burning processes and other vital aspects of effective weight loss. May help support appetite control. May help to support energy levels. Iodine contributes to normal energy-yielding metabolism, the normal production of thyroid hormones and normal thyroid function. May help to support a healthy digestive system. Choline contributes to normal lipid metabolism. Chromium contributes to normal macronutrient metabolism and to the maintenance of normal blood glucose levels. SUPPORTS WEIGHT LOSS GOALS. F-Burner is a fat burning tablet for women and men which, when used with a reduced calorie diet and exercise program, may help you achieve your goals in weight loss and slimming. INCLUDES GLUCOMANNAN (a form of soluble fibre derived from the konjac root). Glucomannan contributes to weight loss in the context of an energy-restricted diet. Glucomannan also contributes to the maintenance of normal blood cholesterol levels. It contains almost no calories and absorbs water in the stomach to expands up to 50 times its weight – making you feel full. SPECIALLY FORMULATED FAT BURNER contains a combination of synergistic herbs and nutrients. Each fat burning tablet combines 11 herbal ingredients, documented in their ability to aid in weight management. UNIQUE, NATURAL HERBAL FORMULA which contains many of the best known ingredients to help you mobilise fat when used in conjunction with a sensible diet and exercise programme – the best solution for long term weight loss results. MADE IN THE UK to GMP Standards for Higher Being. Suitable for vegetarians and vegans. 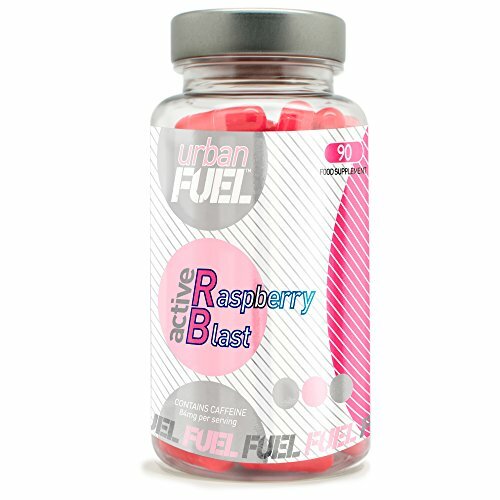 Raspberry Ketone Blast By Urban Fuel Raspberry Ketone Diet Pills Combination Fat Burners with Raspberry Ketone, African Mango, Green Coffee Bean, Cpasicum and Glucomannan to name a few. 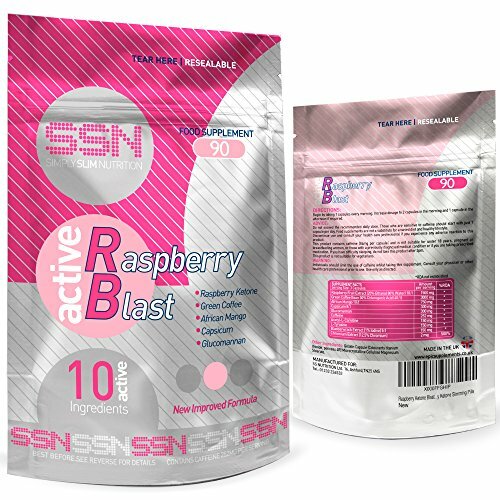 Urban Fuel Raspberry Blast is the latest supplement to be revamped with raspberry Fruit Extract is the perfect combination of powerful anti-oxidents from raspberries to give you best possible chance of reaching your goals. Raspberry Fruit extract helps to regulate adiponectin, which is the hormone used to moderate fat and convert into energy. African Mango helps to maintain healthy cholesterol and blood glucose levels. Irvingia Gabonensis extract (Latin name) is a powerful anti-oxidant and very high in fibre which also helps aid digestion and make you feel fuller for longer. Green Coffee Bean, helps to stabilise blood sugar levels, which can improve brain activity and fight fatigue. Also supports weight loss due to detoxification capabilities which speeds up the metabolism and increase fat burning. Glucomannan, is a natural dietary fibre which has been approved by the EFSA. This dietary fibre expands when hydrated in your stomach therefore helping to decrease your daily food intake. Ultimate Diet Combo of Raspberry Ketones, Green Coffee Bean, African Mango plus now the added benefits of Glucomannan and Capsicum. Great fat burning ingredients to accelerate your metabolic rate. Contains amino acids and essential fatty acids. URBAN FUEL PEACE OF MIND GUARANTEE. Many Raspberry Ketone products have been imported from other countries, from Asia to the USA. Urban Fuel Raspberry Ketone is manufactured in a UK GMP and Sports Accredited regulated facility so you are safeguarded by the highest standards in the world. It is FREE from artificial colours and flavours and is SUITABLE for vegetarians. HASSLE FREE GUARANTEE. Urban Fuel’s famous no questions asked money back guarantee allows you to improve your health with ZERO risk. If you don’t like the products simply ask for a refund and Urban Fuel will honour it. 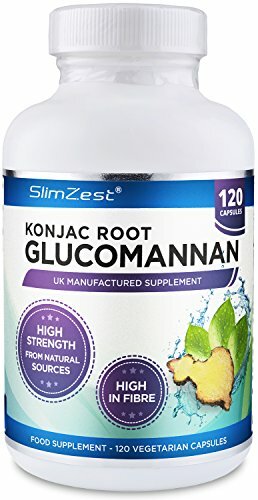 Prozis Pure Glucomannan from Konjac Root 120 Capsules 3000mg – Natural Supplement for Weight Loss, Metabolism Boost and Appetite Control – 20 Day Supply! Glucomannan is a plant fiber extracted from the konjac root. The fiber is not only low in calories, but also swells considerably. With an intake of 3,000 mg per day, glucomannan contributes to weight loss as part of a low-calorie diet. 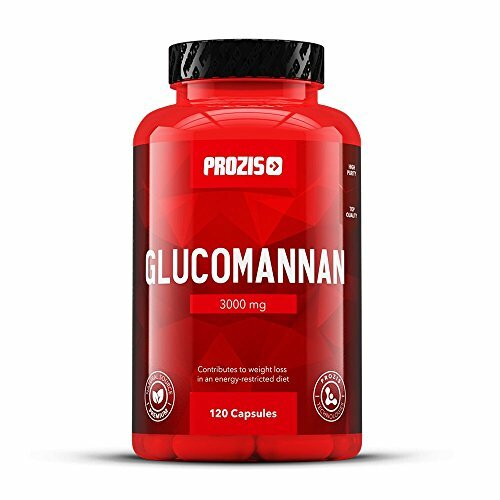 These 3,000 mg are covered by taking 2 LINEAVI Glucomannan capsules 3 times a day, ideally before each meal and with with plenty of water, so that the glucomannan can achieve its full effect when it reaches the stomach. LINEAVI Glucomannan is a dietary fiber supplement derived from konjac glucomannan and the perfect supplement to your diet. 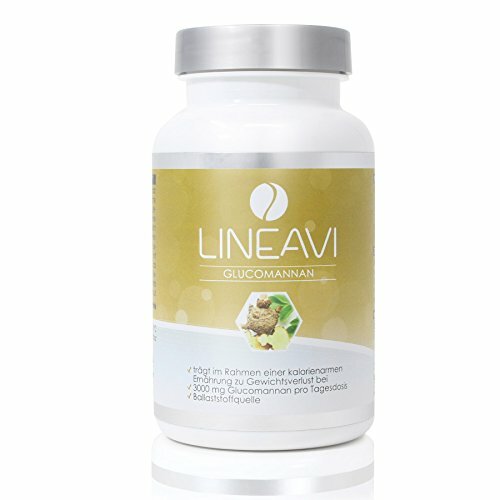 LINEAVI products are based on cutting-edge nutritional knowledge and they are subject to continuous quality assessment. With this, we guarantee that LINEAVI products are only made of ingredients that meet highest quality standards. In this way, our products support you in achieving a new level of well-being. ✅ SOURCE OF PLANT FIBER: The plant fiber glucomannan contributes to weight loss as part of a low-calorie diet. ✅ HIGH-DOSE CAPSULES: Each daily dose contains 3,000 mg of glucomannan obtained from the konjac root. ✅ NATURAL APPETITE SUPPRESSANT: Glucomannan produces a pleasant fullness in the stomach and provides a natural feeling of satiation. ✅ MADE IN GERMANY: Our products are produced and controlled according to the highest quality standards (ISO 9001, HACCP, GMP). ✅ SATISFACTION GUARANTEED: LINEAVI products have received several awards from vergleich.org, among others. Try LINEAVI Glucomannan for 60 days and if you are not satisfied with the product, let us know and we’ll refund 100% of your order. Fat Blaster Appetite Suppressant aids your weight loss by reducing your appetite and helping you to feel fuller for longer. The addition of B vitamins also maintains your normal energy levels helping to fight tiredness and fatigue whilst you diet. The unique formulation contains a carefully selected natural dietary fibre. Each tablet forms a gel-like mass in the stomach when hydrated to help you feel fuller for longer and reduce your appetite. Aids weight loss, help feel fuller for longer and reduce hunger. Skinny Sprinkles is a powder that when poured in water makes a Strawberry Drink with a smoothie texture. The key ingredients in Skinny Sprinkles are scientifically proven to boost weight loss, alertness and stamina and help to reduce tiredness and fatigue. To be taken in conjunction with a calorie restricted diet. How does Skinny Sprinkles reduce the appetite? When taken before a meal your stomach needs less food to feel full. Skinny Sprinkles works by delaying gastric emptying, resulting in a reduced appetite. Gastric emptying refers to the speed at which food and drink leaves the stomach. Put simply when you eat a meal gastric emptying can take up to 2.5 hours to leave your stomach whereas a drink will take minutes. This is why a glass of water will not make us feel satisfied in the same way a meal will. It is the delay in gastric emptying what makes us feel full. When you take Skinny Sprinkles the active ingredient glucomannan (Konjac) starts working in the stomach. It has an extraordinary water holding capacity that forms into a gel like solution. The stomach treats this as food, which delays gastric emptying resulting in a reduced appetite. Skinny Sprinkles is clinically proven to reduce body weight and reduce tiredness and fatigue. Belle® Thermo Burn is a thermogenic fat metaboliser and herbal weight management supplement, which supports the body’s natural fat burning processes, along with the feeling of fullness, energy levels, thyroid function, carbohydrate, lipid and fatty acid metabolism, stable blood sugar levels and other vital aspects of effective weight loss. Glucomannan contributes to weight loss in the context of an energy-restricted diet. This beneficial effect is obtained with a daily intake of 3g of glucomannan in three doses of 1g each, together with 1-2 glasses of water, before meals. Zinc contributes to normal acid-base metabolism, the maintenance of normal bones, the maintenance of normal hair, nails and skin, the maintenance of normal testosterone levels in the blood, the maintenance of normal vision, the normal function of the immune system. Iodine contributes to normal energy-yielding metabolism, the normal production of thyroid hormones and normal thyroid function. Vitamin B6 contributes to the normal function of the immune system, the regulation of hormonal activity, normal cysteine synthesis, normal energy-yielding metabolism, normal homocysteine metabolism, normal protein and glycogen metabolism and the reduction of tiredness and fatigue. Ideal for use during any exercise or weight management programme, THERMOburn is suitable for men and women and is recommended to be used in conjunction with a sensible exercise regime and balanced, calorie-controlled diet. This food supplement has been formulated with a specialist combination of synergistic herbs and nutrients. Each capsule combines 11 herbal ingredients (glucomannan, bitter orange peel, raspberry ketones, caffeine anhydrous, green tea, L-Tyrosine, African mango, capsicum, guarana, Siberian ginseng and piperine), with vitamin B6, choline, zinc, chromium picolinate and iodine. 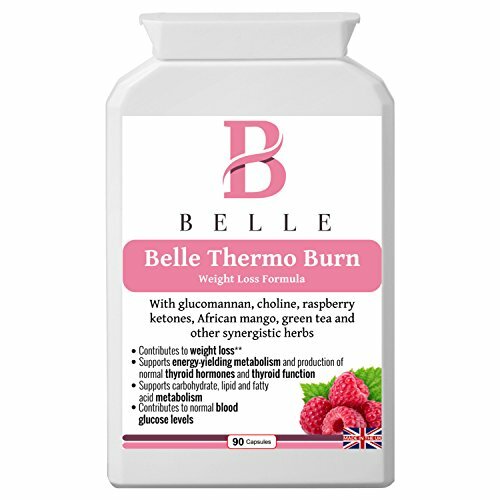 Ideal for use during any exercise or weight management programme, Belle® Thermo Burn is suitable for men and women and is recommended to be used in conjunction with a sensible exercise regime and balanced, calorie-controlled diet. Glucomannan is an amazing natural supplement which in an energy restricted diet is proven to contribute to weight loss. It works by naturally expanding when it comes in to contact with water in the stomach absorbing up to 50 times its weight. Glucomannan is very high is fiber and has almost zero calories it is also proven to contribute to the maintenance of normal blood cholesterol levels making it a great choice for both men and women. SlimZest is a trusted UK supplier of all natural supplements we manufactured all our supplements here in the UK in our GMP certified professional manufacturing facility to ensure optimum safety and premium ingredients at unmatched prices. We have been established for several years and have created some of the best selling supplements in the UK due to our unmatched quality, price and customer service. Our goal is to help you succeed in your goals, that’s why we go above and beyond the call of duty by providing each customer with a wealth of free resources such as a Free Fitness App and eBooks as well as a friendly and knowledgeable support team to answer any questions you may have. Click “Add to Basket” Now & Enjoy A Fresh New Start! Glucomannan is a sugar made from the root of the konjac plant (Amorphophallus konjac) and is the only food ingredient with an EFSA approved health claim for weight loss, making it the most trusted and reliable slimming supplement available. Glucomannan is a natural dietary fibre that expands in the stomach when hydrated. Naturally expanding when it comes in to contact with water in the stomach absorbing up to 50 times its weight can delay gastric emptying and induce satiety leading to a decrease subsequent food intake. Why Customers will Love Urban Fuel’s New Daliy365 Glucomannan Supplements? * Proven to Contribute to Weight Loss as part of an energy restricted diet. * Absorbs up to 50 times its weight. * Amazing Value Large Supply, 180 Capsules. * UK Manufactured Premium Quality. * Premium Strength 500mg Glucomannan Per Capsule. * Ingredients From Natural Sources. Urban Fuel is fast becoming one of the largets and most trusted UK supplier’s of all natural supplements. All our supplements are manufactured here in the UK in a GMP Sport Accredited manufacturing facility to ensure optimum safety. 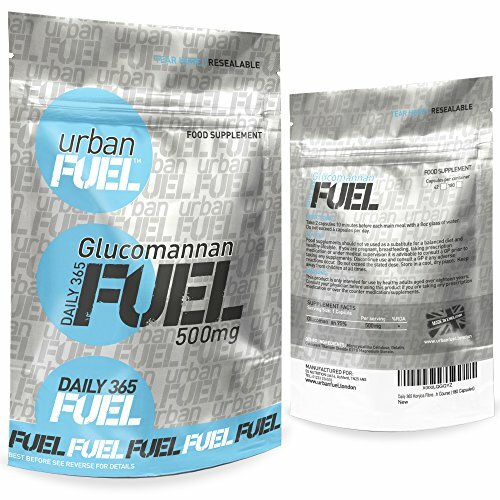 Urban Fuel Glucomannan has 500mg of Konjac Root packed into each and every capsule. This is double the strength of many brands. URBAN FUEL PEACE OF MIND GUARANTEE. Many Glucomannan products have been imported from other countries, from Asia to the USA. Urban Fuel Konjac fiber is manufactured in a UK GMP and Sports Accredited regulated facility so you are safeguarded by the highest standards in the world.